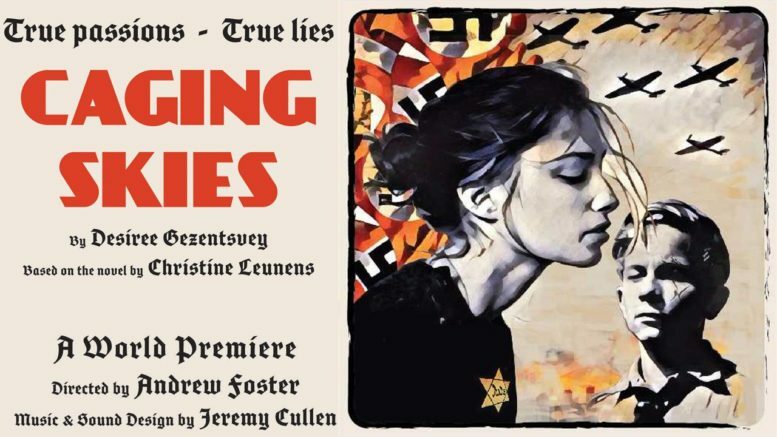 Johannes, a zealous member of the Vienna Hitler Youth, discovers a fateful secret – his family is hiding a young Jewish woman, Elsa, in their home. Her life in his hands, Johannes and Elsa embark on a gripping journey of obsession and love that blurs the lines between the captive and the free, the victorious and the defeated, as the horrors of the war unfold around them and each must find a way to survive. From award-winning writer Desiree Gezentsvey (Nuclear Family) and visionary director Andrew Foster (Red) comes this hauntingly powerful story that lays bare the darkest corners of the human soul. What happens when children innocently embrace an ideological lie, when parents become afraid of their own children, when the lie takes on a life of its own? Based on Christine Leunens’ novel of the same title, nominated for the Prix Medicis and the Prix FNAC 2007, Caging Skies is a must-see psychological drama that examines truth and lies at both political and personal levels, a play of universal relevance and consequence, not only as an echo of past events that shook humankind to its core, but as a confronting reflection of what is currently happening around us. My father was a Holocaust survivor who was both helped by courageous, righteous people and betrayed by others. He taught me to live by the Golden Rule: “Do onto others as you would have them do unto you.” As I peered at the world through the eyes of an innocent Viennese boy (Johannes) who grew up embracing Hitler’s terrible lie, I found myself stepping inside a haunted house, into a love story that encompasses the most complex of human emotions, set against an extreme backdrop in which all lives are at stake. Life or death. What would I do? Would I stand up for my values, risk my life, the lives of my loved ones, to save another? Looking at the realities (and alternative facts!) of today’s world, I hope we will never be confronted with finding the answers to these heart-wrenching questions. Writing the play has been a challenging and fascinating journey. While it was important to me to stay true to the essence of her remarkable novel, Christine’s priceless send-off, “The novel is mine, the play is yours,” gave me the freedom to dissect, select, create and weave all these threads into a new form, as I imagined the characters coming to life on stage.